Everyone loves a burger. 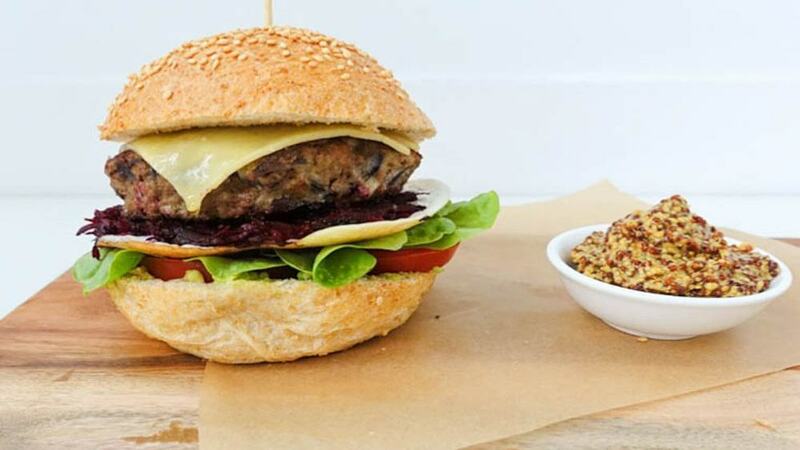 These quick and easy Aussie burgers are loaded with healthy fillings and so super simple, they will be a weeknight staple. Put the mince, red onion, garlic, dijon and soy sauce in a bowl and season with salt and pepper. Use your hands to mix the ingredients until they are well combined. Divide the mixture into 2 portions and shape each portion into a burger patty. Heat a teaspoon of olive oil in a frying pan and cook the patties on each side for 4 to 6 minutes, or until cooked through. When the patties are almost cooked, place 1 slice of cheese on each patty until just melted. Meanwhile in a seperate frying pan heat a teaspoon of olive oil over medium heat, crack 2 eggs straight into the pan and cook until the egg white and yolk is set (flip them, if you like them over easy). To serve, spread the mashed avocado on the bottom half of the bun. Top with lettuce, tomato, beetroot, burger patty, egg then dollop on tomato sauce, mayonnaise or mustard, and cover with the top of the bun.